Some of you may be wanting to know where I have been since my last project post in June. Well, I have been on a journey of sorts and I am not at the end of it yet. 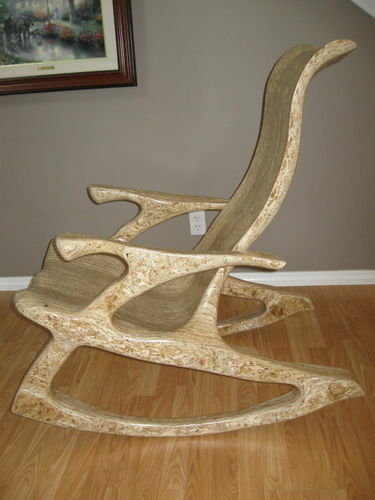 Many of you will remember my experiment with building furniture out of OSB particularly the rocker. It was during this build that I realized that of all the sanders I owned, I didn’t have one sander that was uniquely suited to finishing the various concave radii and transitions of the rocker. 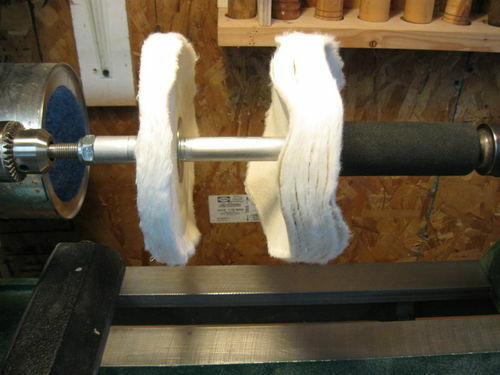 I had a set of the small spindle sanding drums that I tried in my drill motor but it didn’t give me the control I needed as they had a tendency to jump while sanding. 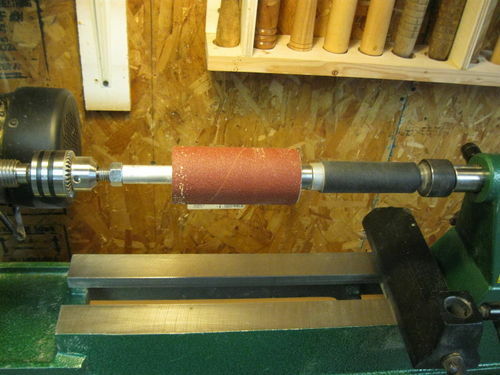 The tool that would be of most help was my Rigid oscillating spindle sander with its various sized sanding drums. I had two sizes of mandrels made. The larger of the two will accommodate any brand of oscillating spindle sander drum on the market that has a 1/2” spindle (I.D.) and has a drum length from 4 1/4” to 6”. That covers about 90% of the Oscillating spindle sanders on the market today. The smaller mandrel can accommodate most of the small spindle sanding drums that have 1/4” Φ removable spindles (5/16” Φ i.d. in the rubber drum). 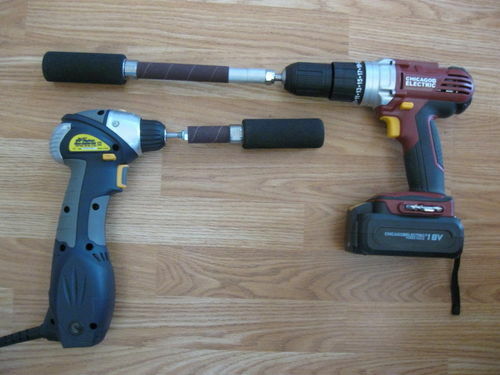 Both mandrels are a one piece construction. 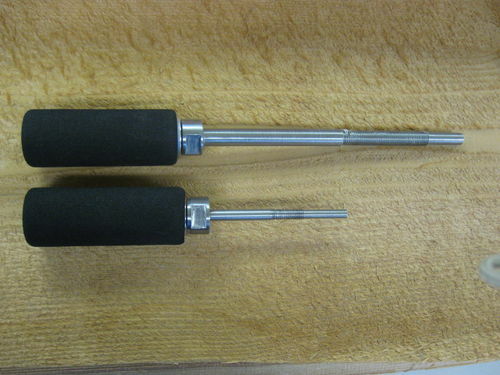 The aluminum handle has two pressed sealed roller bearings one at each end and is held in place with a nylock nut and covered with a soft rubber grip. The handles give the control needed as the drum itself is now in the center rather than the end of the sanding process. One other feature of these mandrels are the centers I had machined into the ends of them. This allows me to mount them in my lathe if I so choose. 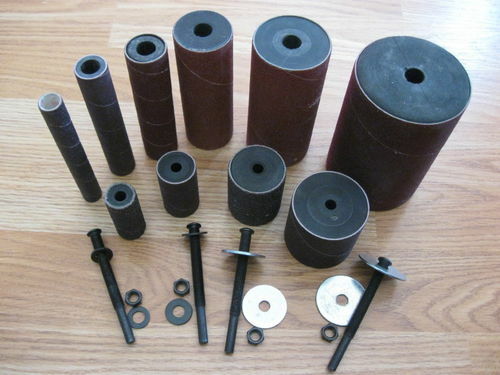 These mandrels can also be used for buffing both free hand or mounted on a lathe. I have developed aluminum adapters for both tools so that they can accommodate other accessories with larger mandrel openings. 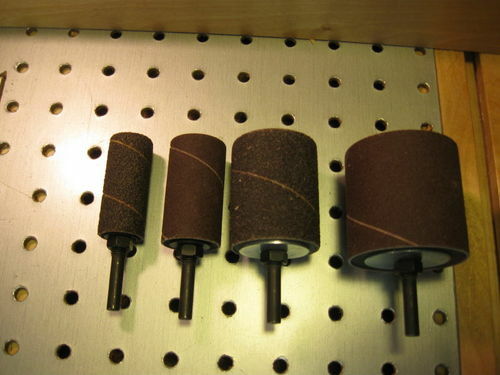 Another nice feature of these mandrels is that they can accommodate sanding drums, buffing pads and other accessories that you already have in your shop. well, having said all of that, this is where I need your feedback. 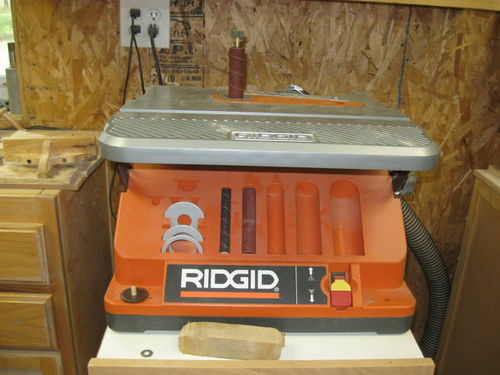 Would one or or both of these tools be of any value in your shop? How would you use these tools in your shop? Do you see any uses for these tools beyond woodworking? What descriptive/catchy name would you give these tools? I would appreciate any and all additional comments you may have. Thank you all for participating. Your input will be an invaluable help in building my website. This is one of those ideas that wouldn’t let go so I am going to pursue it to whatever end is in store. This is a fantastic idea. I can’t even begin to come up with the uses but it will be extraordinary. I hope you’ve filed for patent. That is a super idea. Good support past the end of the sanding drum that way!! 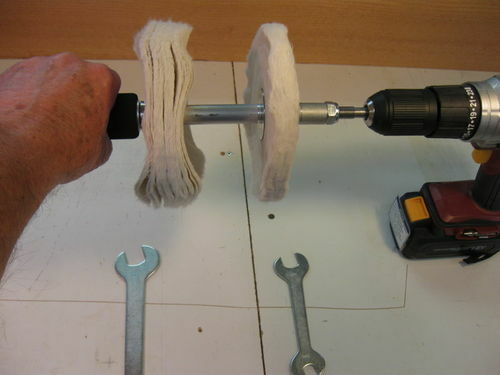 This looks like a worthwhile tool but I just knew you were leading up to a hand held spindle sander. Someone used to make one of those. Milwaukee maybe? 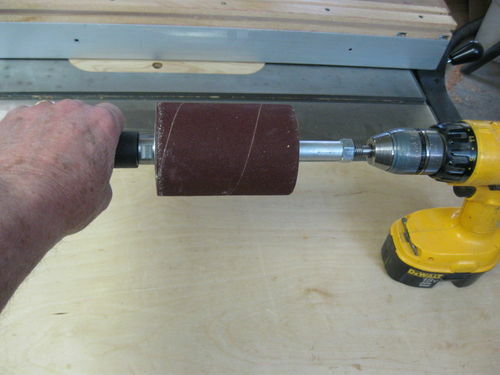 A spindle sander attachment for an angle grinders might be really useful. If I had one in my shop, I suspect I would find uses for it. Sometimes the tool creates the jobs that needs it. Your work on the chair is that of an artisan, a sculpture. I hope you create more laminate projects and show us your results here. Thanks for your input Herb. gfadvm, Grizzly has a hand held spindle sander but it has a pneumatic actuated rubber bladder rather than a solid rubber drum holding the sanding sleeve in place and they only one diameter sanding sleeve rather than the range of sleeves that come with most spindle sanders. firefighterontheside, I actually thought about that idea but I was concerned that an angle grinder produced too many rpms. technoslick, good insight and thanks for the kind words on the rocker. My memory is similiar to Andy’s. I believe a similar tool (or several variations) were marketed back in the mid-80s. If you’re seriously considering manufacturing and marketing this idea, I’d want to make sure it has not already been patented and that you can patent it yourself. If it has been patented, it would be a real pain (not to mention loss) for the original holder to demand you cease and desist. On the other hand, if you don’t patent it and it becomes a big success, the “Big Boys” won’t hesitate to copy it and use their established sales networks to dry up your prospective sales. After having said all that, I’d add it looks like a well thought out and useful tool. Best wishes! It will also be very useful for metal fabrication clean-ups and polishing finished meat items. They are right about when you have the tool available you can come up with other uses for it! I am positive that any of us could/would indeed find multiple uses for it! Even use it for buffing polishes or waxes out! It will also be very useful for . . . polishing finished meat items. Lee, The Grizz doesn’t oscillate. The one I was thinking of oscillated. Bosch maybe? Looks pretty darn smart to me my friend. That could be used for many different sanding tasks. Firstly, I missed your rocker posting. It looks amazing! Great build. As for the sanding attachment I think the majority of shops would find it useful, but maybe not so much in my shop for the kind of work I am doing these days. Lee, The Grizz doesn t oscillate. The one I was thinking of oscillated. Bosch maybe? Were you thinking of the Porter Cable 121? It’s the only hand held oscillating sander I know of. Was discontinued about seven to ten years ago, IIRC. Otherwise bounce it off PASs he is a polishing guru !